In Foreign Front, Quinn Slobodian offers a corrective to the historiography of West Germany by examining the role of foreign students as crucial catalyststo the1960s student protest movements. Slobodian argues that students from the Third World were not just ciphers upon which West German radicals projected their revolutionary visions, but were insteaddecisive actors in their own right. In order to do so, he returns to the major sites of the West German student protests -- the shootings of Rudi Dutschke and Benno Ohnesorg, the occupation of the Free University in West Berlin, among others -- with fresh eyes, reintegrating both students from the Third World and Third World events into the larger narrative of the global 1960s in West Germany. 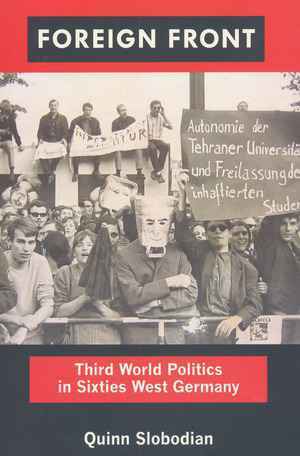 The book defines the “Third World Politics” of its title very broadly, from students from the Third World, to Third World ideas and seminal texts (e.g. Frantz Fanon’s The Wretched of the Earth), to Third World conflicts,to representations of the Third World, and politics about the Third World. Slobodian’s six chapters thus provide a multi-pronged approach, covering (1) individuals from the Third World and the consequences of their presence on West German campuses, (2) the effect of Third World thought and action on student leaders Rudi Dutschke and Bernd Rabehl, (3) West German New Leftist responses to the Vietnam war, (4) the death of Benno Ohnesorg at a demonstration against the Shah of Iran, (5) the “corpse polemics” inherent in New Leftist representations of domestic and international violence, and (6) the West German student movements’ adoption of Mao’s cultural revolution as their own. Slobodian seeks to reinsert the personal into the transnational history of the 1960s student movement, arguing for the importance of interpersonal collaboration in the evolution of revolutionary ideologies among West German students. In that goal, Slobodian is not always successful: Whereas the later chapters which investigate the idea of the Third World are able to marshal a greater field of evidence, many of his examples of personal friendships and close collaborations are not wholly convincing. Thus, the only support presented for the importance of Rudi Dutschke’s “closest non-German collaborator” in the late 1960s, the Chilean Gaston Salvatore, to Dutschke’s thought is an anecdote about how Salvatore came over to translate Che Guevara’s address from the 1966 Tricontinental Conference, and, thoroughly disgusted by the state of Dutschke’s apartment, proceeded to wash his moldy dishes, with Che’s text “wedged […] between the wall and the water tap” (pp. 74-75). While an evocative moment, there are few instances in Slobodian’s text that document anytangible exchange of ideas, tactics, or experiences, to bolster his argument for the “concrete collaboration, activism, and engagement in political theories,” which ostensibly made the Third World a “partner in dialogue, and an object of ongoing collaboration” (p. 5). The few incidents that Slobodian is able to uncover are fascinating, but often leave the reader wanting to know more: How does it come to pass that a Nigerian student at a West German university participates in an anti-Vietnam war march (p. 48)? While this particular anecdote is recounted in asignificantanalysis of the ways in which West German government officials attempted to control popular discourse (and the bodies of foreigners), it all begs further questions about how such participation happened, what was achieved through it, and how its non-German participants experienced it. To a large extent, it can be imagined that this is a fault of the archival record. Foreign students had to concretely do something –- write a political tract, get arrested, get hurt, say something memorable enough to make it into Dutschke’s memoirs –- in order to be rediscovered in the overarching narrative of 1960s West Germany. The many, many, young people who came to study in West Germany but who were not recorded for posterity, except as acollective group of “non-Germans (p. 72)” or “Angolans, Algerians, and South Africans (p. 82),” or simply as members of the various student groups (the Iranian or African or Iraqi Students Associations etc. ), remain nameless, although their participation in these protests and actions was nonetheless crucial. Slobodian rejects the notion that the Third World acted as a ““projection screen” for the desires of West German radicals (p. 10)” arguing that such a stance is part of the “perverse legacy of [Edward] Said’s Orientalism” which has created binaries where there were none before, and as such, is untenable in a situation wherein Third World activists exploded these binaries by speaking in the idiom of the West (human rights, political freedoms), with and at the West. Slobodian’s idiosyncratic reading of Said is contradicted by the excellent job he does in chaptersix, wherein he elucidates the projection of the Chinese cultural revolution onto New Leftist self-understandings, allowing them to eventually declare themselves “Chinese,” adopting not only Chinese theory, but also the sartorial symbols of Chinese communism, without direct contact to Chinese communists (p. 187). These paradoxical deployments of both the idea of the Third World and the individuals who inhabit it, speak to the complexity and multi-valence of the topic at hand. The book is strongest when not focusing on individuals from the Third World per se, but on the larger specter of Vietnamese, African and Iranian victims in the aggregate, and how they were deployed within West German student discourses of power and anti-government action. Slobodian’s narrative of the evolution of the student protests, as well as the ideological conversations that underpinned them, provides a fascinating window on the intellectual history of the New Left in Germany, and how their self-perceptions, goals, and tactics were affected by the various encounters with world events (the Vietnam war, the death of Patrice Lumumba), and local/foreign instigations (protesting the visits of Congolese Prime Minister Moise Tshombe, and the Shah of Iran to West Berlin). Chapter 4’s analysis of the June 2 protest masterfully interconnects the symbol of Benno Ohnesorg (in Germany, and among Iranian dissidents) with inner German discourses about the Nazi past and the contemporary Rechtsstaat. Chapter five on “corpse polemics” must be lauded for its fascinating insights into the intersections of violence, anti-colonialism, and visual culture. Pivoting on an analysis of several late 1960s films, Slobodian presents an engaging and illuminating analysis of the evolving role of violence, the body, the Third World, and human rightson the revolutionary activism of the period, as well as upon German society as a whole. Foreign Front is written in an accessible and quick-witted style, but nonetheless suffers from rhetorical flourishes (the “sanguinary Vietnam War,” p. 15), numerous typos, especially in non-English words, and odd translations (e.g. “unofficial co-workers” for the East German Stasi’s inoffizielle Mitarbeiter, instead of the more conventional “unofficial collaborators,” p. 56-7). Ultimately, Slobodian’s book is a welcome corrective to the traditional narratives of the West German student movement and West German history writ large, as well as a fascinating example of the importance of international events, ideologies, and texts, to national histories. Julia Sittmann: Rezension zu: Slobodian, Quinn: Foreign Front. Third World Politics in Sixties West Germany. Durham 2012 , in: Connections. A Journal for Historians and Area Specialists, 10.11.2012, <www.connections.clio-online.net/publicationreview/id/rezbuecher-17916>.